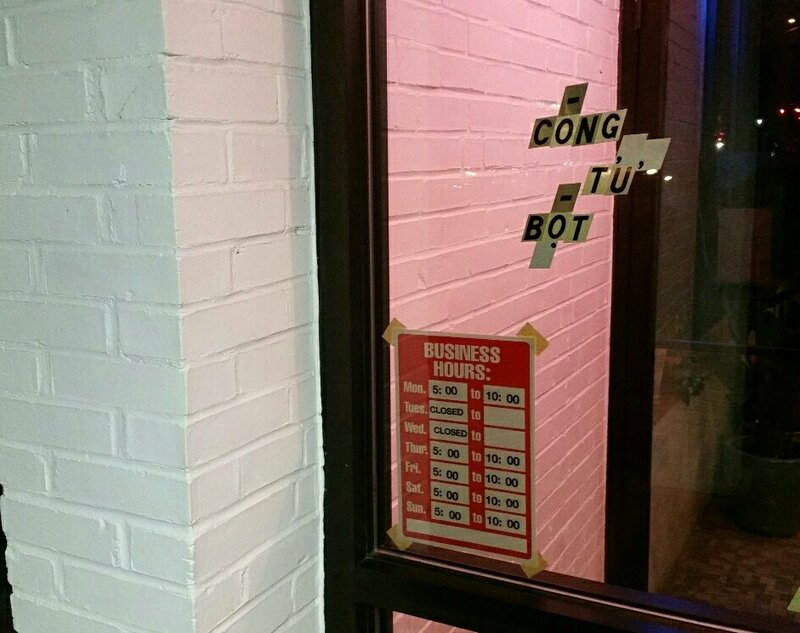 The entrance to Con Tu Bot is nondescript. The purveyor of Vietnamese rations has self-adhesive mailbox letters affixed to the window next to the door which indicate their name. The accents are included, but impossible to comprehend without an ability to read Vietnamese. Their hours – 5-10 Thursday through Monday – are posted just below that. Having opened over the summer, the restaurant, which Google translates to “dude” in English, is part of a growing and magnificent food scene on Washington Ave. The smallish interior, with counter seating and several tables, has a bit of New York City vibe with sparse decor and two large garage doors that run the width of the restaurant. It looks like someone just threw a kitchen and dining area into a random empty space – not that that’s a bad thing. A waitress gives me the option of sitting at the counter or the one available table which will need some cleaning. Because of my left-handedness and the inevitable elbow jab to anyone sitting to the left of me, I wait for the table while the server cleans it. It’s ready shortly after my wife arrives from parking the car. We settle in with cups of water and get to scoping out the menu. Headers on the food list include Noodles, Add-ons, Sides & Snacks, and Sweets. On the back, I find some drink options – beer, wine, sake. The menu is relatively small and neither of us are up for a drink due to an early morning of physical activity on the horizon. In passing up a beverage, I also notice that the menu plainly states that the restaurant uses an abundance of cilantro and peanuts. I suppose that to be a good start. Items with one pepper next to them are spicy; two indicates very spicy. 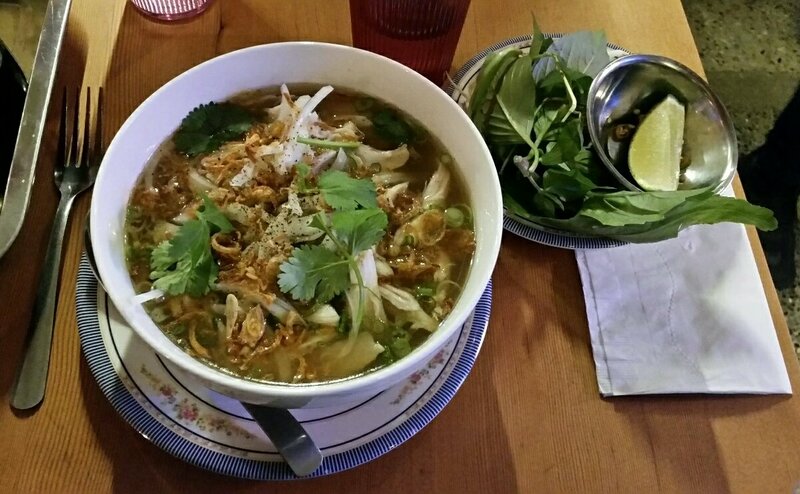 I like spice, but find it tough to pass up a good bowl of pho and decide on the Pho Ga – house style chicken pho. 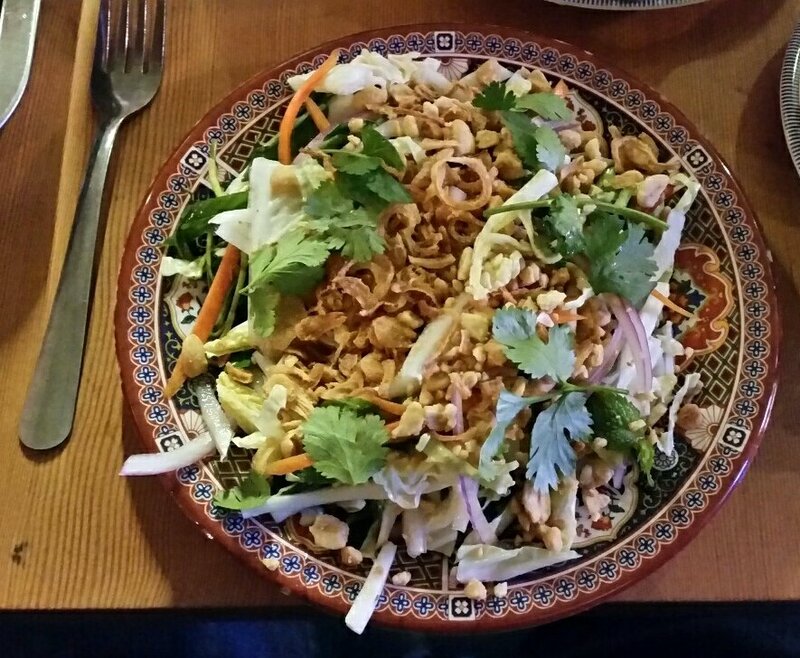 In addition to the the Vietnamese noodle soup, I also choose Goi Cai Bap – cabbage salad w/ red onion, chilis, peanuts, fish sauce, and lots of herbs. That has one peppper next to it. 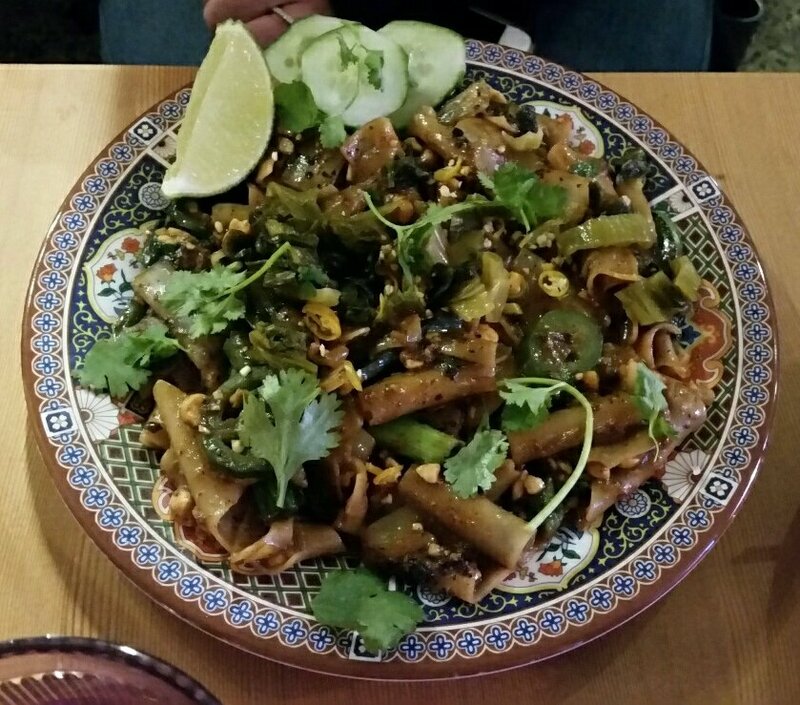 Mrs. Portlandeater, who has occasional battles against spicy noodles, decides to try her hand at eating the very spicy Hu Tieu Xao – spiiicy stir fried rice noodles w/ Cinese broccoli, scallions, many chilis, peanuts, and red eye brown sauce. I assume the triple “i” and italics in the first word of the description indicate a sort of seriousness in regards to exactly how spicy it is. It’s actually the only available two pepper item on the menu. My requisite bowl of herbs to go with my pho is delivered. Thai basil, sprouts, lime, and about four tiny, thin slices of peppers – serrano maybe? – are on the plate. Shortly thereafter, our meal comes out. I had requested the cabbage first, but it hardly matters. My noodles need to cool a bit anyway. I gawk at my salad momentarily, admiring the hefty sum of cilantro and peanuts on it. The menu didn’t lie. With my first bite, the salad emanates salt, vinegar, and heat. The veggies are fresh and the herbs add mountains of flavor. The peanuts are a great crunchy topper. Another bite tells me a little less salt might be better, but I’m not overwhelmed by it; I expected a fair amount of sodium from the fish sauce. A half dozen bites in and my mouth starts to burn. I’m sweating a little. I power through about half the salad and stop to recover. My wife, having eaten several bites of her noodles, tells me her mouth is on fire. I can only imagine since hers is supposed to be significantly spicier than mine. I am able to finish my salad, but again, my mouth is burning and I relax with sips of water – an absolute non-solution for a scorched mouth. Eventually, I muster up the strength to begin eating my Vietnamese noodle soup. It’s not as big as others I’ve had, but it’s heartier with lots of meat and noodles. I throw in everything on my herb plate which kicks it up a notch. I also drop a little hoisin and sriracha on top. As I’m digging in, my wife calls it quits on her plate. In the battle of Mrs. P vs. the noodles, noodles win. I ask if she would like to trade meals, wanting to test my own fortitude again the capsaicin-rich dish. She loves the pho and I love the stir fry with its typical sweet flavors, but need a break after about a half-dozen bites. My wife is no wimp. These are some hot noodles. I carry on eating them, but stop regularly to recover. After about four rounds, I finish, but my perspiration is peaking. I eat the last few bites of the soup too and feel like I have done well. Our meal comes to $31 before tax. There is no tipping. I know some other local restaurants have recently tried that method and it hasn’t worked out, but as a consumer, I find it excellent. It’s fast, simple, and avoids having to do math on a full stomach and – for those who are drinking – an inebriated brain. We pay and make our way out. As I walk away from Cong Tu Bot, I am left with delight. I like spicy food that is actually spicy and that’s what they serve. It’s all very tasty too; the spice is just an added bonus. If you don’t like heat, there are items for you – primarily the pho, but you certainly don’t have to avoid going. Add in the interesting ambiance and this is a place I’ll be visiting again in the near future. It will be a great cold weather hideaway this winter. This entry was posted in Portland, ME food and tagged blog, food, peterpeterportlandeater, pppe on November 18, 2017 by peterpeterportlandeater. I never have a quick answer about where to go when someone wants to go out to eat with us in Portland. There’s plenty of great reastaurants and lots and lots of very good ones. I rarely pick the most expensive or the cheapest even though some of those are my faves, trying to find the best balance of great food, atmosphere, and prices that won’t break the bank. A perfect place to take friends doesn’t really exist because everyone has different tastes, but the first thought that came to mind this time when friends said they were coming to Portland was a place I’d been looking to return to. Little Giant, opened earlier in the year on Danforth St., was a locale I had visited over the summer and needed to revisit. Last time, the scenery was relaxing, the food rock solid, and the drinks worth taking an Uber home for. Mrs. Portlandeater and I got to the restaurant before our friends and were seated. It brought back memories of the warm atmosphere I remembered from the last time we were there. We started looking at the drink menu. She had heard so much about the Espresso Martini with rum, tandem coffee, and coffee brandy which the menu touted as the best. She was certain she wanted that. 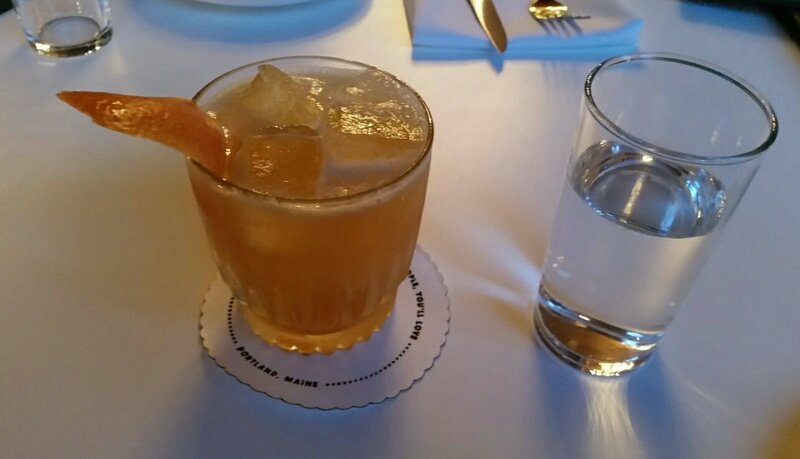 I was up for the Born to Run – vodka, lime, agave, clove, bitters – which sounded pretty boss. When our counterparts arrived a few minutes later, we had our drinks and they ordered another Born to Run and Angel Eyes – rum, lime, grapefruit, pineapple gomme, blue. I loved my B2R which tasted like a slightly tart juice mixture. My wife’s martini was excellent – reminding me of a spiked coffee, because I suppose it pretty much was a spiked coffee. She indeed confirmed it as the best she’d had. I’m not sure I knew I was ordering apps for the table, but I ordered some and no one asked for any others. I started with Little Biscuits – maple-whipped lardo, pepper jelly – and the Cheese Ball – made with blue cheese, aged cheddar, dried blueberries, toasted pecans. 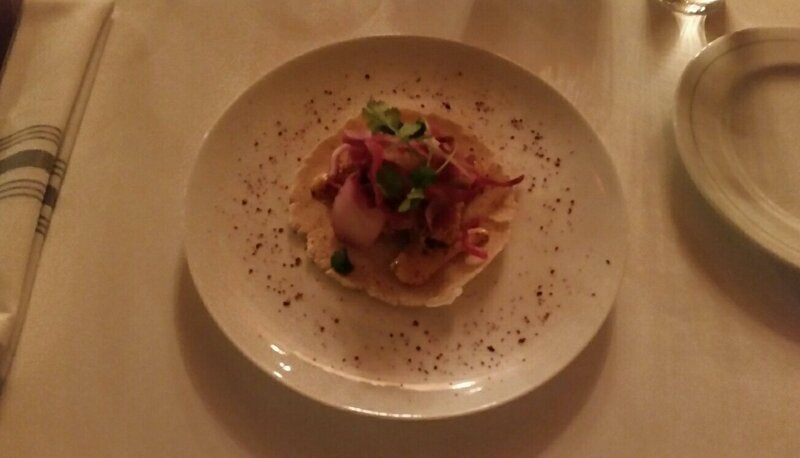 Then I threw in an Oyster Taco – cabbage slaw, chipotle tartar sauce, house-made tortilla – just for myself. We then each ordered our main courses individually. Our apps arrived and I jumped right in to the mix, taking half a biscuit into my palm. Smearing some lardo and jelly on top of it, I drove it toward my mouth. 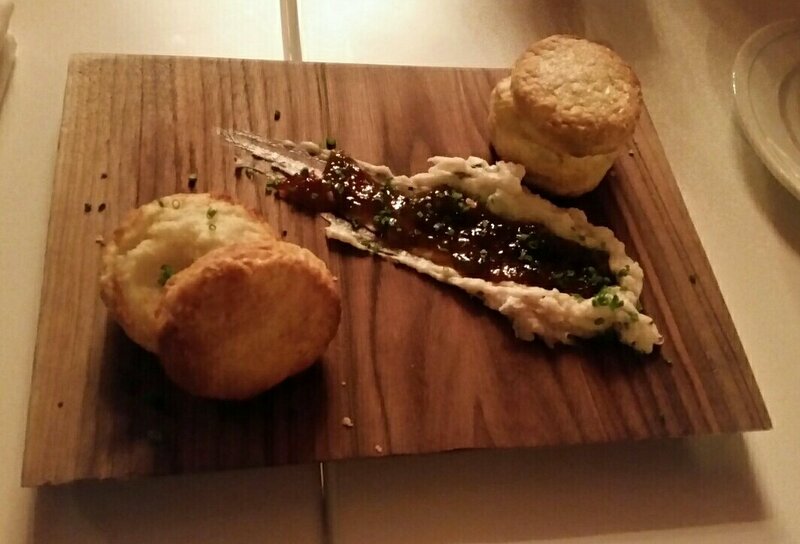 The herby, sweet, mildly spicy combination on top of the flakey biscuit provided quite a flavor combo and it was good – a bit more complex than standard biscuit fare. It was a starter I would want after a day of hard work. They were comfort food tailor-made to relax with. On the other hand, the cheese ball – sweet, barely pungent, and crunchy – was party food. Perfect with my drink, or probably any drink, that little ball of love was as delicious as the day is long. 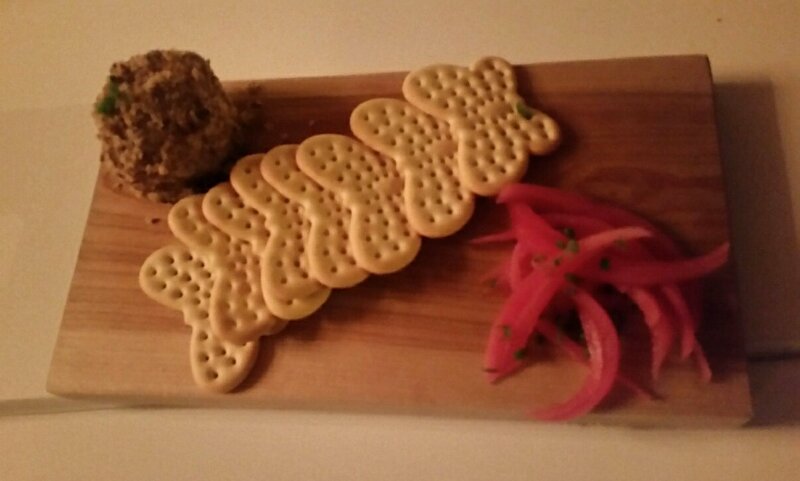 I ate more than my share on the butterfly crackers it came with, seriously considering ordering a second when it was done. The oyster taco fit the bill too as the crunchy, fried seafood was pleasantly paired with the slaw and tarter flavors for a solid spin on both oysters and tacos. Shortly after the apps were gone, we received our entrees. I had ordered the LG Burger – American cheese, pickled grilled red onions, iceberg lettuce, BBQ mayo. 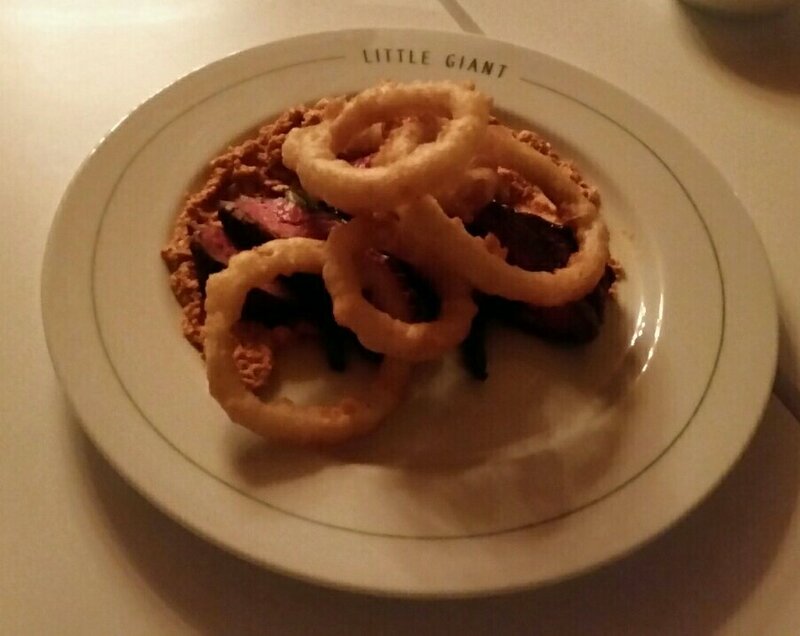 My buddy went with the Grilled Bavette – green beans, romesco, buttermilk onion rings. 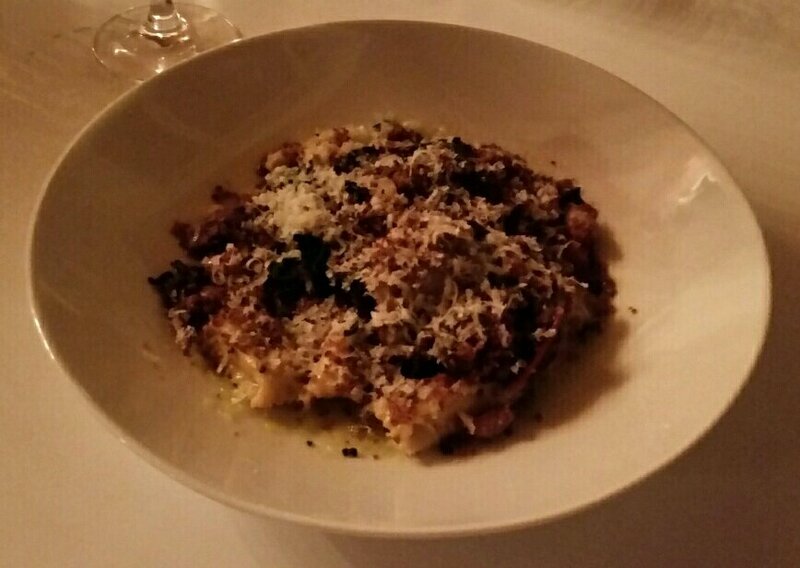 The ladies both were recipients of the Mushroom Agnolotti – winter squash, cranberry beans, house-made ricotta, Swiss chard, bread crumbs. With the new food came another round of drink orders including a rosé, prosecco, and a Chuparosa – tequila, lime, grenadine, chile. As the waiter left, I grabbed my burger and took an initial bite. 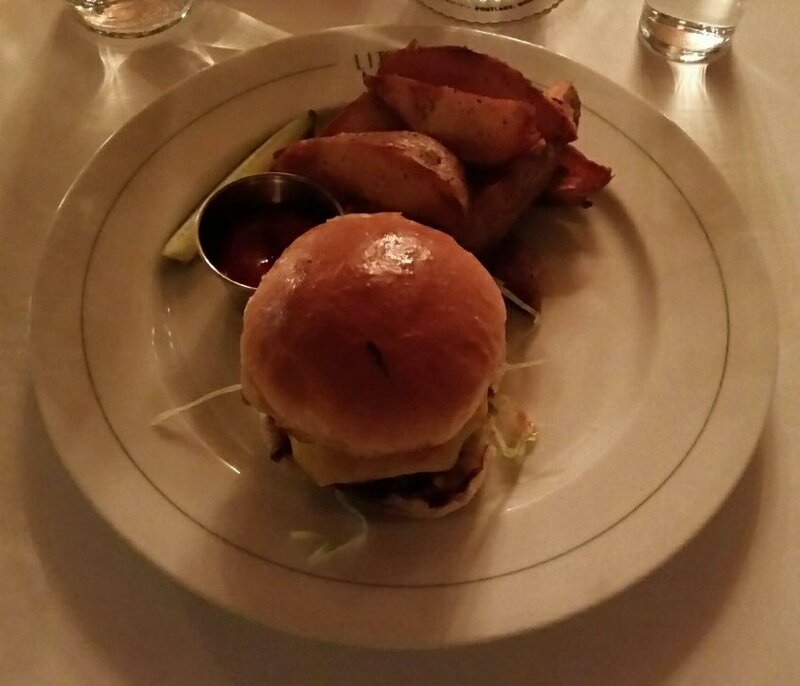 Fresh, juicy, and delicious, the burger was simple, but abundantly satisfying. Potato wedges on the plate were piled on top of each other like a game of Jenga and a bite revealed a nice potato that was as I remembered from my last visit. As I ate my burger, I briefly took the opportunity to try Mrs. Portlandeater’s agnolotti which is a version of ravioli. The mushroom flavor was powerful and I thought it brilliant. Mushroom in pretty much any dish is a winner, but this one was so potent, I gave it extra points. We all worked on the meals until we were finished and decided it would be a good idea to order dessert. Another drink, a coffee, two Mexican Chocolate Donuts with mocha pudding, whipped cream, and pretzel crumble, and Apple Pie with maple whipped cream completed the dessert order. 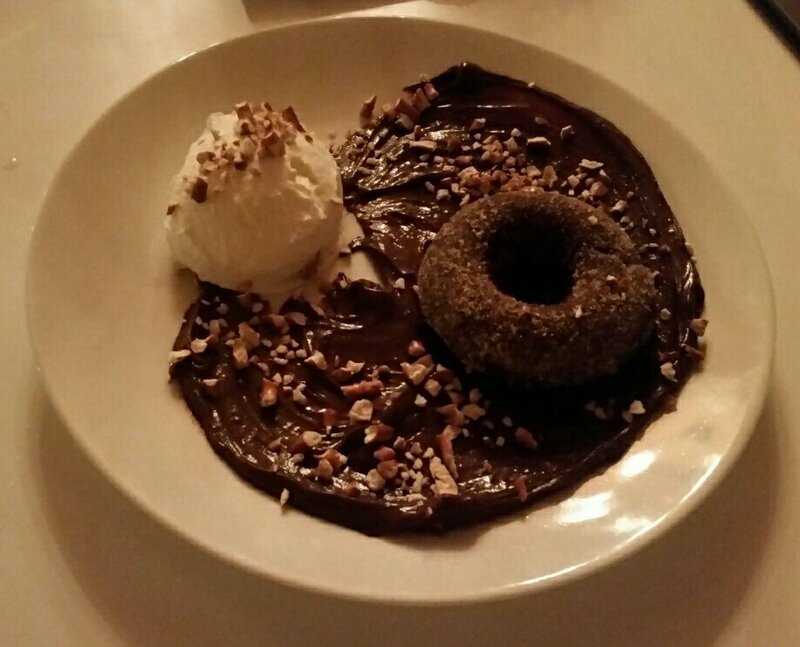 I was only planning to have a single bite of donut, but when the surgared ring came out, sprawled upon the plate in a bath of pretzeled pudding with whipped cream nearby, I quickly changed my tune. That first bite of donut was perfect. The whipped cream took the edge off the double chocolate which would have been too much for me without it. I liked the pretzel crunch which added some noise to the dish. 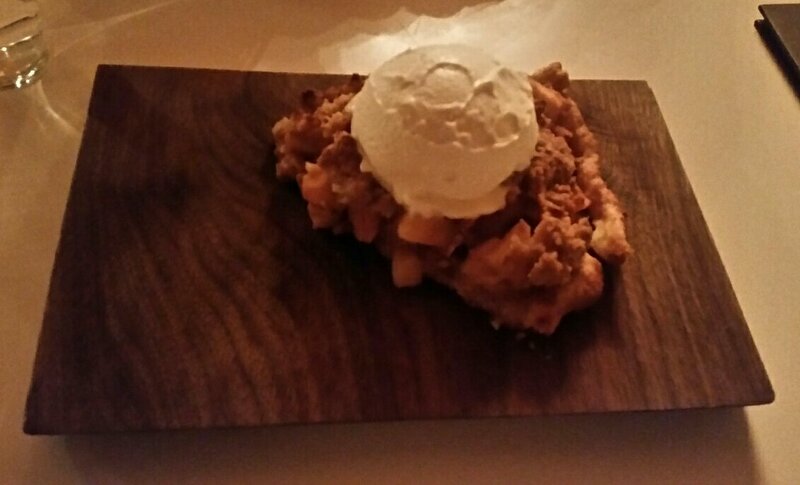 My buddy found the apple pie a little doughy for his tastes and I agreed after trying a bite, but it wasn’t bad and the serving was particularly large compared to what I’m used to. After three full courses, a magnitude of calories, and our fill of alcoholic beverages, it was time to say “goodbye”. The tab came to $233 before tip for four of us with eight drinks and lots of food. Little Giant continues to please. I love their ambiance and the food makes me smile. After a couple visits, I have a good feel for what they’re doing, and I like it. I’ll be returning to try more of their menu, reordering some favorites in the process, and quite possibly bringing new guests to check it out. 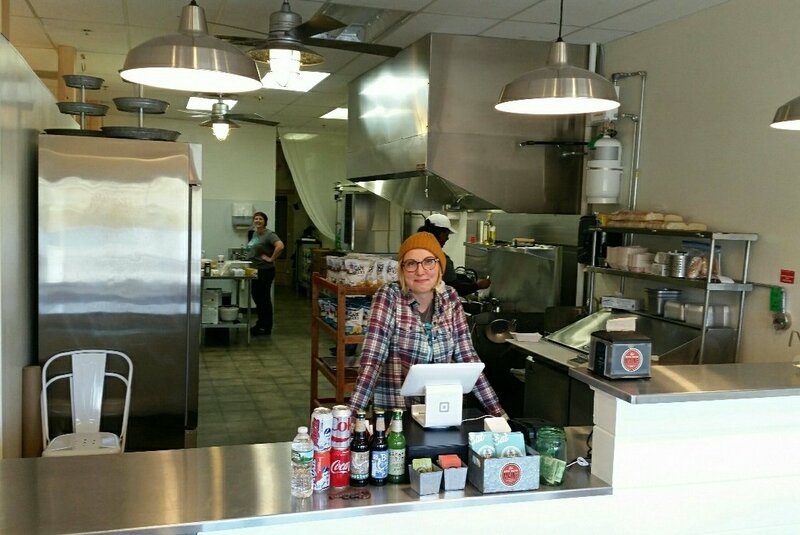 This entry was posted in Portland, ME food and tagged blog, food, peterpeterportlandeater, pppe on November 12, 2017 by peterpeterportlandeater. For me, lobster only in the summer isn’t quite enough. 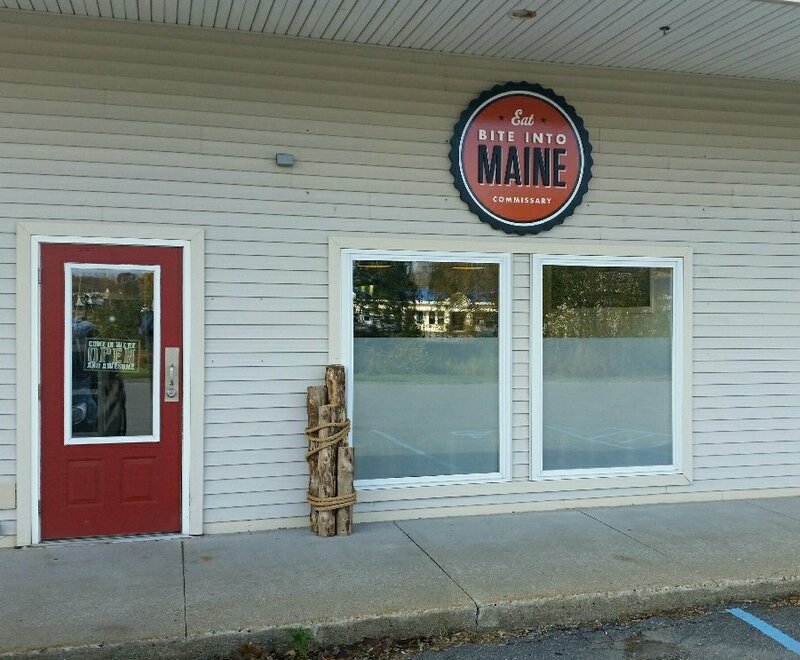 That seems to be the feeling Bite Into Maine’s Sarah Sutton is looking to tap into as she opens Bite Into Maine Commissary at 185 US Rte. 1 in Scarborough tomorrow. The new counter service eatery with a dozen seats will be serving their very popular food truck rolls year round in addition to adding some novel items to the menu. The location isn’t completely new to Sutton’s business as it’s acted as the kitchen for the food truck service for a while. But with a few renovations, the former prep-only space can now welcome walk-in customers looking for fresh lobster meat smooshed between fresh, doughy housing. Catering and large group orders will also be available. Added to the standing food truck menu are some new melts without lobster and corn chowder. 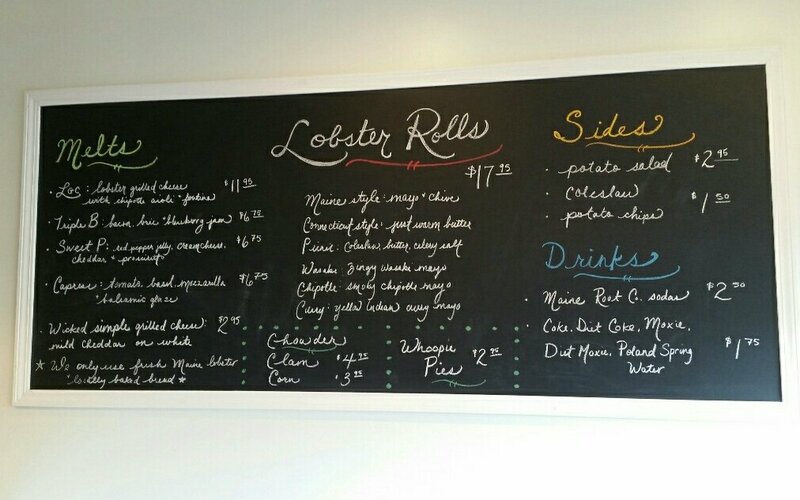 Still there are all half-dozen varieties of their famous lobster rolls for $17.95 apiece. There’s also clam chowder, sides, drinks, and whoopie pies to round out your lunch. And if you’re really in the spirit, there’s also branded shirts and hats for sale. As a bit of a lobster purist, my past experiences with BIM only involve eating their Maine style lobster roll with mayo and chives, but the new commissary gave me the opportunity to try something new. After considering Connecticut – warm butter only, chipotle, and curry varieties of the sandwich, I decided wasabi style with “zingy” wasabi mayo was the ticket. I threw in a cup of the corn chowder for good measure. I took the food to go. Once back at my lair, I dug into my chowder which was full of corn and potatoes. A little hot for my comfort, I put it aside after a couple of bites and moved onto the lobster. My first bite was a whirlwind of pleasure. The wasabi was as perfect as could be – just strong enough that you wouldn’t forget it was there, but not potent enough to cause nasal char. While the roll was great with wasabi, it wasn’t lost on me that the fresh, sizable pile of lobster still held all its flavor. The combination of the two on a fresh, grilled roll was just brilliant together. I finished the roll, went back to the chowder to finish that, and was pleased with my work on both. It had been a great lunch. My food came to just under $25 with tax. I couldn’t have been happier. 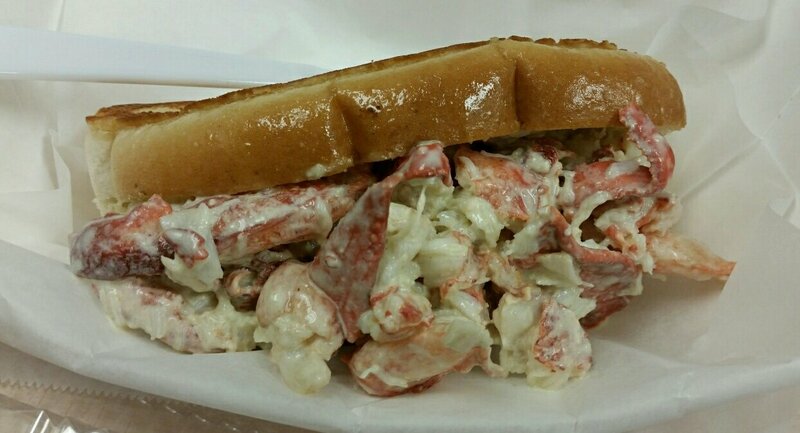 The chowder was fine, but it’s hard to compare it to the extraordinary lobster sandwich that Bite Into Maine is known for. Head there starting tommorow for some of the best lobster around. Go ahead and get one of those whoopie pies while you’re there too. They are a notoriously great way to end a meal packed with Maine’s favorite seafood. This entry was posted in Portland, ME food and tagged blog, food, peterpeterportlandeater, pppe on November 7, 2017 by peterpeterportlandeater. With all the breakfast and brunch options in Portland, it’s hard to choose which is my favorite. However, one place that keeps me coming back somewhat regularly is Deering Avenue’s Bayou Kitchen. The restaurant with a solid cajun flair has a variety of options for the hungry customer and their laid back, “let’s get you fed” attitude makes for simple service done right. I love the restaurant’s theme – think gumbo, jambalaya, and crawfish – which is a fun twist on the standard brunch menu, but their inventive daily specials and wall of hot sauce add exponentially to the experience. I regularly order one or more of the three items listed on the wall-hung chalkboard displaying both sweet and savory treats and a few dashes of hot sauce – minimally – are a requirement every time I am there. As always, we were there for breakfast, and once again the specials got my attention right away. Yes, I really wanted the Homemade Banana Bread French Toast at the bottom, but after a hard workout I was thinking something a little more healthy might be a wise option. 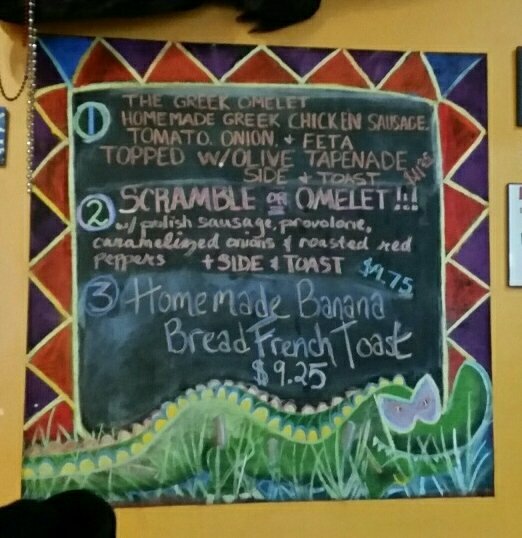 On top, I spied The Greek Omelet with homemade Greek chicken sausage, tomato, onion, feta, and topped with olive tapenade. It came with toast and a side and I felt it would probably meet my needs. 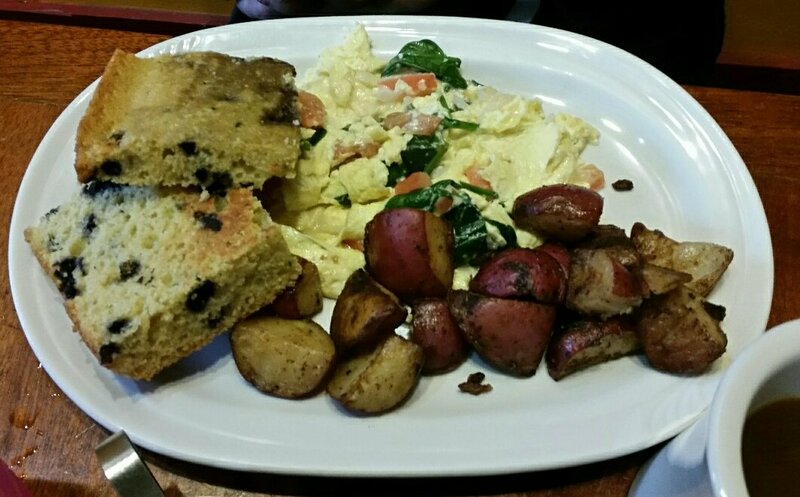 My wife ordered an Omelet with spinach, tomato, and onion and chose home fries and blueberry cornbread to go with it. 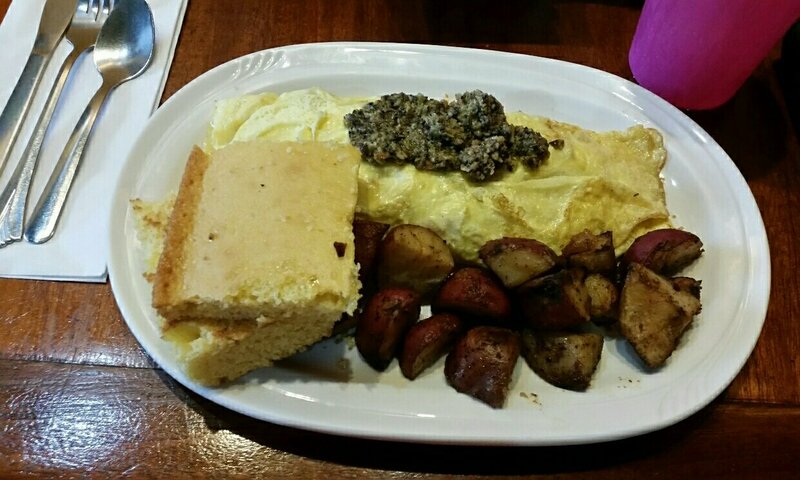 I did eventually opt for the Greek omelet, and got the homies and standard cornbread after considering the jalapeno cheddar version which I remembered as excellent from my prior experiences consuming it. After a brief chat with a gym friend who arrived unexpectedly only moments after us and touted the Huevos Rancheros as his favorite, we received our food. I appreciated the consistent, large heft of the omelets. Mine had an oval smattering of the tapenade on top. I was ready to get down to business and forked the first bite over to my mouth. The omelet sported the right combination of meat, vegetable, and cheese. The olive tapenade was a winner. I find it is often hit or miss, but this one was really good. The only issue I had was with the sausage. It was flavorful, but I really needed some heat with it. Enter Lost Woods Hot Sauce. It’s a Maine original and one of the sauces that graces all the tables. A bit of that on the egg was all I needed to complete the protien-laden creation. Several bites into the egg, I had to move to the potatoes and cornbread. The “homies”, as they are affectionately named, were beautiful, sizable bites of spud with a nice seasoning, a thorough grilling, and acted as a perfect receptacle for ketchup, hot sauce, or a well-proportioned combination of both. Oh, they were quite good. And that cornbread? Wonderful every single time regardless of the variety ordered. It wasn’t difficult to finish our food. We needed fuel and tasty nourishment is never tough to consume. Our tab came to around $25 before tax and tip which included a coffee. Quick, easy, tasty, and reasonably priced, Bayou Kitchen hits all the marks. They make simple food including cajun favorites that consistently satisfy and also offer items that shock and amaze – particularly those specials – which might just throw a wrench into your usual brunch order. This entry was posted in Portland, ME food on November 5, 2017 by peterpeterportlandeater.